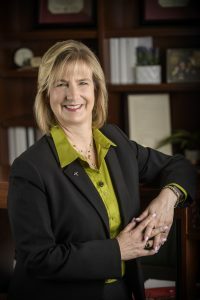 Wright State University President Cheryl B. Schrader, Ph.D.
Wright State President Cheryl B. Schrader has been named to a prestigious national advisory board for a project to identify and eliminate barriers impeding the participation of women in engineering higher education. The Engineering Deans Gender Equity (EDGE) Initiative by the American Society for Engineering Education (ASEE) is aimed at attracting and advancing diverse women faculty into an inclusive and equitable academic engineering culture. “I’m very passionate about increasing the participation of people who have been traditionally underrepresented. It’s my privilege to have the opportunity to serve on this national board,” said Schrader, one of only five members on the board. The initiative will be funded by a three-year $961,560 ADVANCE Adaptation grant from the National Science Foundation (NSF). About 200 engineering schools have already expressed interest in participating in the project. The initiative aims to bring about a nationwide transformation in engineering faculty by providing tools, resources and evidence-based practices to promote a diverse, equitable and inclusive academic engineering culture. The goals of the initiative are to reduce key institutional and system-level barriers to the ability of engineering deans to recruit, retain and promote diverse women faculty and to conduct research into whether reducing these barriers will result in positive equity change. Tasks include creating a gender-equity database and web index, hosting workshops and webinars, and developing strategies to enhance leadership pathways for future women academic engineering administrators. Serving as co-principal investigator of the initiative is Norman Fortenberry, ASEE executive director. Previously, Fortenberry served as the founding director of the Center for the Advancement of Scholarship on Engineering Education at the National Academy of Engineering and has served in various executive roles at the National Science Foundation. Over the years, Schrader has been involved in the National Science Foundation program ADVANCE: Organizational Change for Equity in STEM Academic Professions. She has served on national advisory boards for universities that have had ADVANCE grants, has participated in proposals and has worked with the NSF in shaping the overall ADVANCE program. When Schrader became dean of the College of Engineering at Boise State University in 2003, she was one of only five women serving as engineering deans at the more than 400 engineering schools across the nation. And at that time, women made up only 3 percent of the engineering department chairs. During her eight years as dean, she led a transformation that increased the percentage of women faculty in the college, ranking No. 2 in the nation in women faculty and No. 1 in terms of women in leadership positions, at 40 percent. Schrader says bringing more women and other underrepresented groups into engineering higher education widens the diversity of perspectives and results in better decision-making. She says studies have shown that there is an unconscious bias in engineering in the hiring process favoring male candidates. “I think we’ve done a good job in tamping down explicit discrimination, but there still is an underlying bias that is challenging, particularly when the minority numbers are so small,” she said. She said women are often drawn to careers in engineering where they can see an immediate impact to society, such as biomedical or environmental engineering. Engineering education leaders have worked to also change the conversation to emphasize to women meaningful careers in other disciplines. “It’s being able to talk about engineering not being the tinkerer in the garage, but having the opportunity to take dreams and make them reality and make a difference in the world,” Schrader said. She said there is a very large workforce shortage in the STEM disciplines that threatens the nation’s economic vitality and global competitiveness. “If we tap into those groups that traditionally have not been in engineering we can actually solve that critical workforce shortage,” she said. In 2017, Schrader was named a Fellow by ASEE for her outstanding contributions to the field, a rare honor conferred on only a small fraction of the society’s members. Founded in 1893, the ASEE is a nonprofit organization of individuals and institutions committed to furthering education in engineering and engineering technology. Its 12,000-plus members include deans, department heads, faculty members, students and government and industry representatives who hail from all disciplines of engineering and engineering technology.